We accepted it was terrorism. But what if we were wrong? What if London's July bombings were the greatest criminal deception of our time? 7 July 2005: In the midst of Operation Theseus, the largest terrorist investigation that the UK has ever known, Detective Inspector Jake Flannagan begins to ask difficult questions that lead to the mysterious disappearance of his girlfriend and his sudden suspension from the Metropolitan Police. Who masterminded London's summer of terror? Why can't Flannagan make headway in the sprawling investigation? Are the bombers the perfect pretext to mask a different plot entirely? Is Jake's absent Security Service girlfriend really who she claims to be? 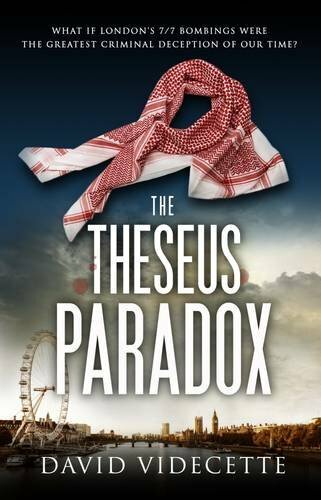 While hunting for the answers to the most complex terrorist case in British history, one man will uncover the greatest criminal deception of our time. Terror, extremism and fear of the unknown. Sometimes the answer is much closer to home. I had originally planned to read this book on the weekend of 14th and 15th November, but after the terrorist attacks in Paris on Friday 13th I felt a bit too emotional to pick up a book about the bombings on our home soil in 2005. 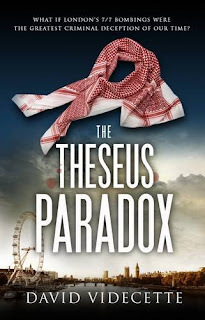 I was so eager to read The Theseus Paradox that I picked it up a few days later and could hardly bear to put it down. DI Jake Flannagan is a great character - he's like a mixture of Harry Bosch and Jack Bauer as he pushes, and frequently oversteps, the boundaries. He's full of insecurities and frequently turns to alcohol and women to drown his sorrows. It's hardly surprising as his job puts him under such immense pressure and I think anyone who has ever criticised our police force should read this book. We all know what happened on 7th July 2005 from the events relayed to us on the news, but this book really gives us a highly detailed insight into the police investigation and takes us back in time to 2005. I was absolutely astounded that I had forgotten about events that were happening around that time. I'll not refer to which events as it is a crucial part of the amazing twist in this story. I absolutely loved the way that this book was written. Each chapter commences with a time and date stamp along with a location, so you really feel like you are following the investigation as it progresses. As Jake's personal life is explored and we are introduced to his girlfriend, Claire, I did feel like she was hiding something as she seemed very stand-offish. Claire does have a big part to play in the story and I hope that some of her secrets are revealed in the next DI Jake Flannagan book. This is an absolutely cracking debut novel - it's fast-paced, a definite page-turner and sometimes shocking (verified by my frequent 'catching of flies' as my mouth gaped open in shock/horror/surprise). It's a story based on facts; how much is fact and how much is fiction is up to you to decide.